The San Jose Blog: New Street Food Incubator Launches! New Street Food Incubator Launches! Just about all of the incubators in San Jose are focused on technology, so it is refreshing to see something different coming into the mix. Food Social is essentially a street food incubator, helping street food vendors grow a successful business. Later this week, you'll be able to try out the various food innovations these street vendors have come up with at Motif. Full details below! (You can also check out their site over here). outdoor terrace along with drink specials all night. Friday, September 16th 2011, 5pm-9pm. $5 with online registration, $10 for registration at the door. 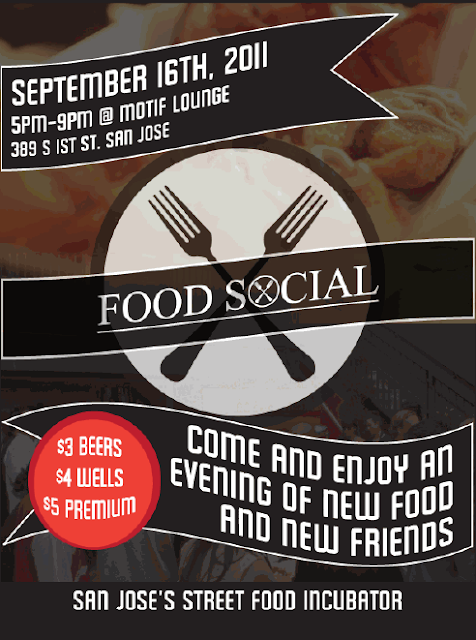 Visit www.food-social.org to register for the event.